Mini E the basics | What Car? The Mini E is at a more advanced stage of development than Renault's Kangoo Be Pop Z.E and is ready to be leased to a handful of customers in the UK, and other countries, from this autumn. Prices haven't been announced here, but US owners are being asked to pay $500 (around 300) a month to run one of the cars for up to a year. We'd expect a similar pricetag in the UK. Mini, and parent company BMW, will use the data gathered from this real-world experiment to develop its entire electric car programme. The lithium-ion batteries reduce the Mini E to a two-seater, so its practicality take a hit, but, in return, give the car a maximum range of 154 miles. Mini reckons that with two people on board and ancillaries such as air-conditioning running, it will still be able to drive 100 miles between plug sockets. Top speed is 95mph, while the 0-60mph time of 8.5 second should come in handy for whenever you happen to find yourself navigating the hill climb at Goodwood. People who are chosen to test the Mini E will have a charging point installed in their garage, which can fully recharge the car in two-and-a-half hours. Hook it up to the same plug point that you use for your kettle and it'll take longer, but charge it all the same it will. 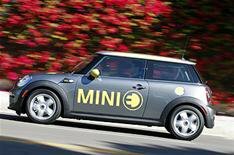 Mini says production versions of electric cars will be able to take advantage of battery swap stations that have may have evolved. Imagine driving onto a forecourt and switching your battery instead of pumping gas. Denmark and Israel are already pushing ahead with this kind of infrastructure.